No this is not a recipe for some kind of cake my friends. That is what I did in tonight's sauna session (bake for 37 minutes at 86C or 186.8F). I have now done 4 consecutive sauna sessions, and I have another 5 left to go, so almost half way through my heat acclimatisation program (or over halfway if you consider the midday desert runs too). When I got in the sauna it was 86C (186.8F) and it remained more or less at this temperature throughout my 37 minute session. This time I did no light exercise. I simply lay on my back and enjoyed the experience (or tried to at least). After 30 minutes I felt like I needed a break so I left the sauna and took a cold shower. That made me feel suitably refreshed, and I was then able to get back in the sauna for another 7 minutes, making a grand old total of 37 minutes. At the end of the session I went to lie down for a while and I felt my heart beating much faster than usual. I didn't feel ill in any way though, which is great. In terms of fluid intake I drank 1.5 litres of water throughout the session, mixed only with one sachet of Bios Life Matcha and no electrolytes. There is only one aspect about being acclimatised to the heat that I find strange. Apparently you start to sweat more and to sweat earlier. 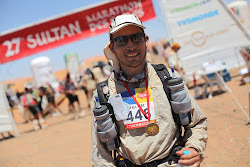 This is an obvious benefit in helping to cool the body down, but surely in a race like the MDS where water is limited it will be a disadvantage? I can only assume that it is offset by the fact that you are not exerting yourself as much as a non acclimatised runner and so have a need to consume less fluids in this way. If anyone does know the answer please let me know. In the meantime have a good evening and eat, drink and be merry.